FIG. 7.34.10 Flocculant feed system with manual dispersing equipment. FIG. 7.34.11 Flocculant feed system with manual dispersing equipment and separate feed tank. centration of 0.25% by weight. A screw feeder adds dry flocculant at a variable rate (<10 lb per min) into the vortex formed within a mixing bowl. Water at 40 psig and 25 to 100 gpm first passes through a strainer and a water meter. 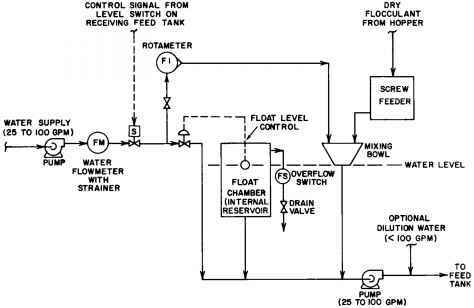 Then it reaches a solenoid valve activated by a float control that monitors the liquid level in the feedtank receiving the prepared flocculant solution. The water flow is then split, with most of it passing through a valve and rotameter controlling the flow through the mixing bowl. The remaining water passes through a small internal reservoir equipped with a float valve. This maintains the required water level in the bottom of the mixing bowl for optimum dry flocculant dispersion. The combined flow from the mixing bowl and the reservoir is then pumped through a pump at 25 to 100 gpm directly to the feed tank or combined with another stream of dilution water (<100 gpm) before delivery to the feed tank. The flocculant solution is further mixed in the feed tank before it is displaced by the incoming flow and delivered to the point of addition in the treatment plant. The floc-culant disperser can be operated either manually or mechanically. Other simplified units are commercially available for preparing flocculant solutions in the intermediate range of 0.5 to 25 gpm. The manual disperser is limited to the preparation of small quantities of flocculant solution. Wastewater treatment facilities should consider an automatic flocculant disperser (see Figure 7.34.12) when treating larger volumes of water flow. The hopper is filled manually with dry flocculant on a daily to weekly basis, depending on plant flow rate. 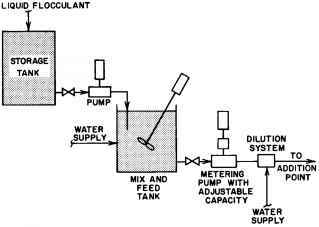 An automatic dry floccu-lant addition system should be incorporated when large volumes of water (>100 mgd) are treated. 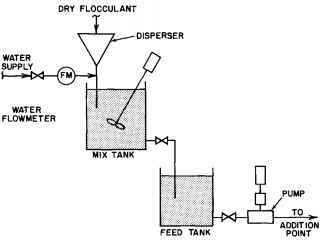 Figure 7.34.13 shows a flocculant feed system with an automatic disperser that incorporates a level control on the feed tank. FIG. 7.34.12 Automatic flocculant disperser. FIG. 7.34.13 Flocculant feed system with automatic dispers ing equipment. treated. The average feed solution concentration for most flocculants is 0.25 to 0.5% by weight. In applications where liquid flocculants are added at high concentrations, the wastewater treatment facility prepares the feed solution by diluting the concentrated bulk solution as shipped. 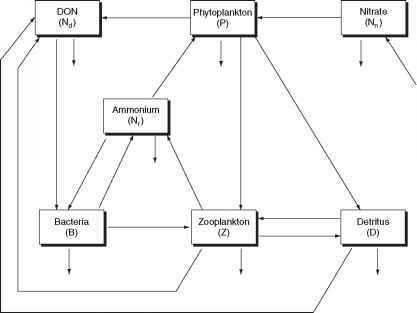 Figure 7.34.14 shows a liquid flocculant feed system. Wastewater treatment facilities can apply flocculants by diluting a concentrated solution and then feeding the resulting dilute solution to the stream to be treated. Preparing large volumes of dilute solutions is not necessary. A small volume of the concentrated feed solution can be metered and diluted to a lesser concentration immediately before it is added to the stream to be treated. Environmental engineers should consider the chemical time requirement for completing the dilution step, the storage tank size, and the chemical pump capacities when determining the feed solution concentration. FIG. 7.34.14 Liquid flocculant feed system. The flocculation of SS, precipitated inorganic salts, and organic complexes adsorbed or absorbed to particulates is not subject to the same design criteria as conventional water treatment that uses inorganic coagulants alone. The time for flocculation after the flocculant addition and prior to settling can be considerably less (under 5 min) than the time recommended for water treatment plants, which frequently exceeds 30 min. Experience shows that prolonging gentle mixing after the initial rapid dispersion of the flocculant does not increase the removal and can partially destroy the floc particles. Environmental engineers should also consider the charging period of adding a metal coagulant and adding the flocculant if both agents are used. FIG. 7.34.15 Coagulant-flocculant addition points. of a weir, at the entrance to an aerated-grit chamber, or at some other location prior to settling, as shown in Figure 7.34.15. Adding the flocculant before low-lift pumps can cause floc destruction. However, the suction side of these pumps is acceptable for the addition of inorganic coagulants. An aerated-entrance channel to the primary clarification tanks is beneficial in the design of a flocculation basin. Flexibility in the addition points and the possibility of varying floc-culant concentrations insure optimum agglomeration of solids.